An accessible modern translation of essential speeches from Thucydides’s History that takes readers to the heart of his profound insights on diplomacy, foreign policy, and warWhy do nations go to war? What are citizens willing to die for? What justifies foreign invasion? And does might always make right? For nearly 2,500 years, students, politicians, political thinkers, and military leaders have read the eloquent and shrewd speeches in Thucydides’s History of the Peloponnesian War for profound insights into military conflict, diplomacy, and the behavior of people and countries in times of crisis. 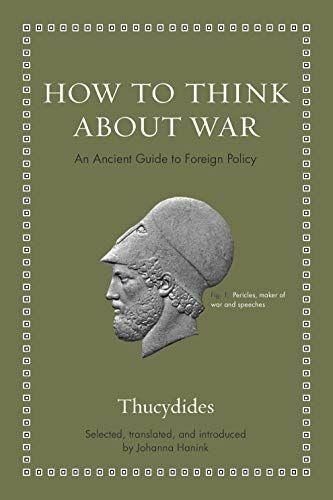 How to Think about War presents the most influential and compelling of these speeches in an elegant new translation by classicist Johanna Hanink, accompanied by an enlightening introduction, informative headnotes, and the original Greek on facing pages. The result is an ideally accessible introduction to Thucydides’s long and challenging History.Thucydides intended his account of the clash between classical Greece’s mightiest powers—Athens and Sparta—to be a “possession for all time.” Today, it remains a foundational work for the study not only of ancient history but also contemporary politics and international relations. How to Think about War features speeches that have earned the History its celebrated status—all of those delivered before the Athenian Assembly, as well as Pericles’s funeral oration and the notoriously ruthless “Melian Dialogue.” Organized by key debates, these complex speeches reveal the recklessness, cruelty, and realpolitik of Athenian warfighting and imperialism.The first English-language collection of speeches from Thucydides in nearly half a century, How to Think about War takes readers straight to the heart of this timeless thinker.